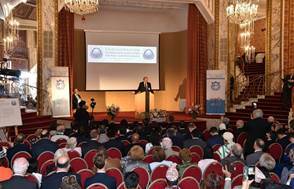 UPF-Europe, Vienna - The Universal Peace Fedeation organized on April 29, 2018 in Parkhotel Schönbrunn the Inauguration of the Interreligious Association for Peace and Development (IAPD) in Europe and the Middle East. 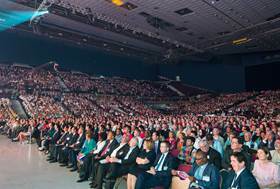 It was attended by 350 participants, including international UPF leaders from around the world. It is time for humanity to embrace universally shared values, going beyond differences of ideology, race, nationality, and religion, and pursue a path of mutual cooperation and mutual prosperity. In this way it is possible to build a world of lasting and sustainable peace that can be bequeathed to future generations. 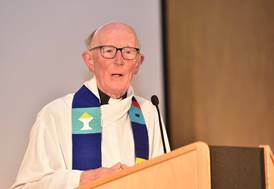 To fulfill this task, religious leaders have a primary responsibility to cooperate beyond denominations and work in harmony with leaders in all fields of society. 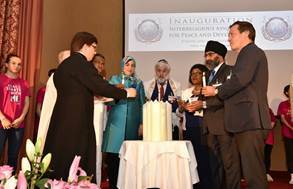 Religious leaders and leaders of faith-based organizations proposed the formation of a world-level interfaith association through which to work together for peace and development. 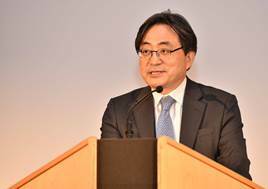 The session began with a speech by His Excellency Shin Dong-ik, the Ambassador of the Republic of Korea to Austria, who had been invited to share with the assembly about the recent political breakthrough between the North and South Korean leaders. 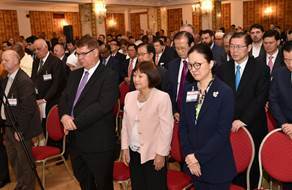 He explained in some detail the issues at stake and the possible steps toward unification that could be taken by President Kim Jeong-un and President Moon Jae-in. 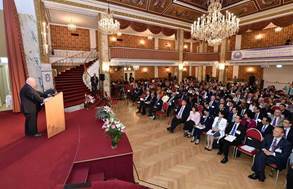 Dr. Felix Unger, the Austrian president and co-founder of the European Academy of Sciences and Arts (EASA) gave the keynote address. 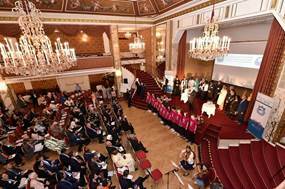 Founded in 1990 by Cardinal Koenig, Professor Lobkowicz and himself, as an interdisciplinary and transnational network to address challenges of the post-Cold War era, the EASA is currently a network gathering 1700 intellectuals, including more than 30 Nobel Prize laureates. 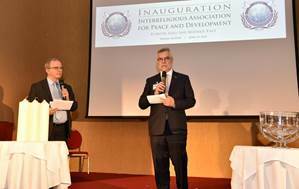 The well-known Austrian surgeon expressed his support for the establishment of IAPD, sharing his vision of a common engagement of scientists and spiritual leaders for the sake of peace and development. 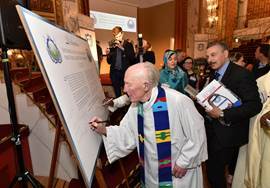 Then, four prominent religious leaders took the stage, representing Christianity and Islam, Europe, the Middle East and Africa: an Apostolic Archbishop from Zimbabwe, a woman leader from the Middle East, grand-daughter of the late Grand Mufti of Syria Sheikh Ahmed Kftaro, the Dean Emeritus of St Peter’s Cathedral in Geneva, and the president of the World Congress of Faiths from the United Kingdom. 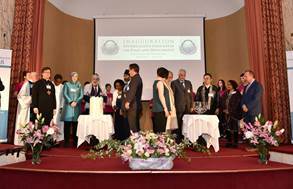 Each one of them recommended an active interreligious effort through interdenominational cooperation, an engagement with leaders in all fields of society, and the mobilization of women in every peace process. The Peace Ceremony began with a musical interlude. 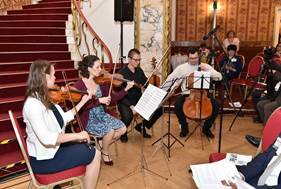 A string quartet of young artists from Austria and the Czech Republic delighted the audience with a beautiful rendition of the Pachelbel Canon. 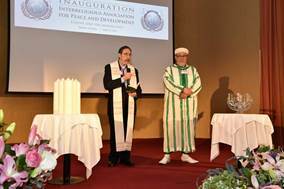 Then a Catholic priest from Spain, former ecumenical delegate of the diocese of Madrid, and the rector of a major Mosque in France, stood together on stage for an interfaith prayer given in English and in Arabic. 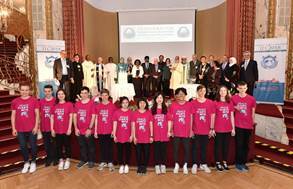 The candlelight and water ceremony was initiated by 12 young people, dressed in “Peace Starts with Me” Festival colors, who came on stage holding small lit candles and glasses of water – water which had been brought by participants from different countries and continents. 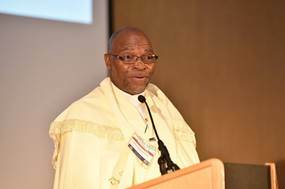 As they lined up, the Dean of the Class of World Religions of the European Academy of Sciences and Arts, a co-organizer of the conference, explained the symbolism of light and water as sources of spiritual and physical life. 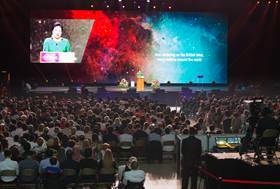 Then, 12 conference participants, each representing a different religion or denomination, lined up on stage behind two tables set up with large candles and a transparent water bowl. Receiving light and water from the young people, they simultaneously lit the candles and mixed the waters, as sacred music was softly played by the quartet. 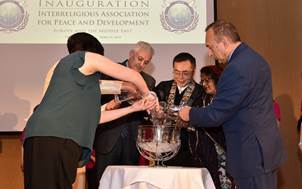 Finally, reading the IAPD Declaration, the Dean of the Class of World Religions announced the establishment of the Interreligious Association for Peace and Development in Europe and the Middle East. 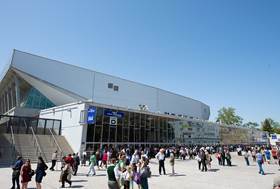 In the afternoon, filling four large buses, conference participants were taken to the “Peace Starts with Me” Festival at the Wien Stadthalle, downtown Vienna. 10,000 people from all over Europe, the Middle East, Russia and beyond gathered at the Festival. 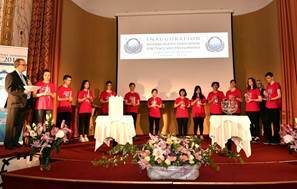 A very beautiful entertainment had been prepared, including the three-hundred-voice Longfield Gospel Choir from Austria and the Japanese Soprano Seiko Lee. 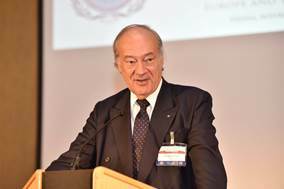 The main speech was given by the UPF Co-founder, Dr Hak Ja Han Moon, who was introduced by the former Austrian Defence Minister, Dr Werner Fasslabend. She recalled the importance of the development of Christianity in Europe, as well as some of the human failures that delayed God’s providence, then she concluded with a message of hope for our modern era, centering on families and youth living for the sake of others and for the world. 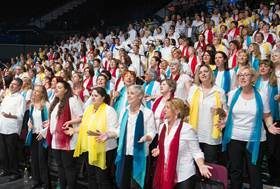 Participants were then entertained to a high-quality show, from the Hungarian group Attraction’s Shadow theatre, to the modern dance troupe Spark from Malta, to other European pop singers. Finally, with her powerful voice, the American Gospel Star Yolanda Adams concluded the show with songs full of heart, ending with a “Yes We Can” song that brought everyone to their feet. 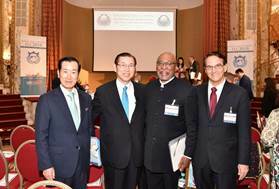 The International Leadership Conference concluded with a large dinner banquet at the Parkhotel Schönbrunn. 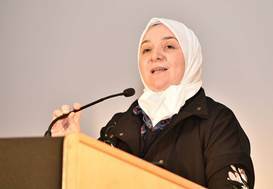 Congratulatory words and reflections were shared by the former president of Albania, a Moroccan scholar and a woman leader from the United Kingdom. 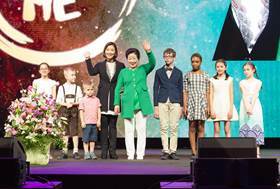 The chairman of FFWPU Europe & Middle East, chief organizer of the Vienna events, encouraged all participants to actively engage in IAPD activities, after which Soprano Seiko Lee concluded the evening with songs in German and Russian language which delighted the international audience.